ESP has several internal teams and committees for its internal organization and coordination. Steering committee advises the Executive Committee, provides oversight of the operation and governance of the ESP, and makes broader decisions affecting the general membership of the ESP. International Relations Commission strengthens and maintains ESPs role in the ES science/policy/practice nexus at an international level and provides access for ESP members to key organisations. Conference Design Commission develops a consistent program for the ESP-conferences. Additionally there are some teams working on our services. You can read more about them on our Community page. Organizations as well as individuals can become ESP members (see ESP membership page). ESP members elect the Steering Committee. The purpose of the Steering Committee is to appoint and advise the Executive Committee and make decisions affecting the general membership. The total number of SC-members is limited to 30. The Executive Committee is responsible for ensuring proper functioning of the Partnership. Membership is limited to 7-9 persons: Chair, co-chair, Secretary, Treasurer and 3-5 Coordinators. The partnership is governed according to the ESP Bylaws. The current ESP Bylaws were approved by majority vote in September 2014. 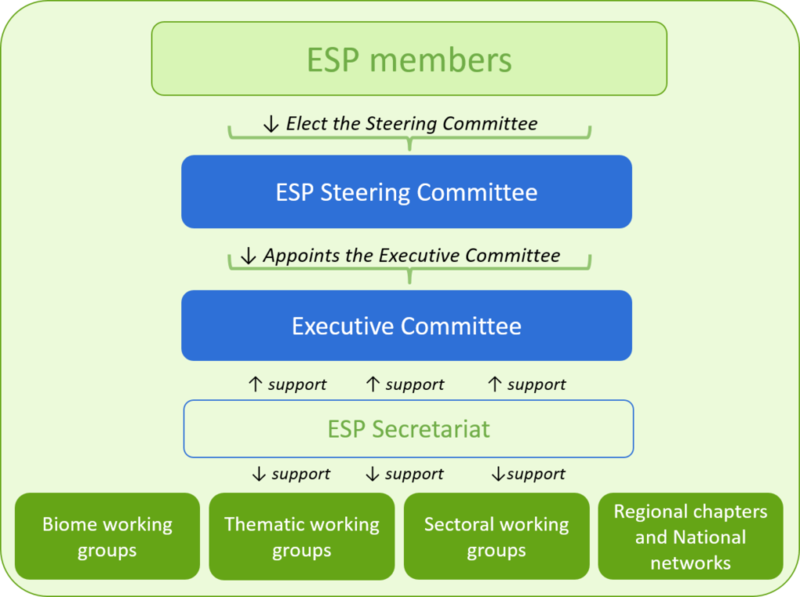 The ESP secretariat supports the Steering Committee & Executive Committee, ensures effective communication with the Members and provides support to the Working Groups. ESP has three main types of ESP Working groups which are led by active individuals of the ESP membership, to facilitate further development of the science and practice on specific topics and stimulate information exchange and outreach.